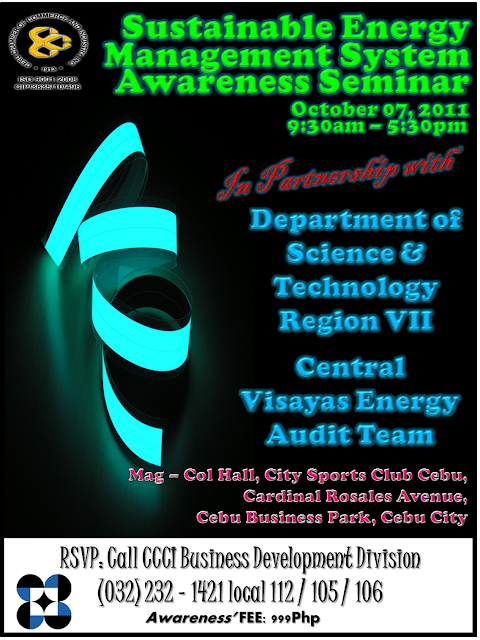 Cebu Chamber of Commerce and Industry (CCCI) organized “Sustainable Energy Management System Awareness Seminar " in partnership with The Department of Science and Technology Region VII (DOST-7) and the Central Visayas Energy Audit Team which will be held in Mag-Col ( Magallanes-Colon) Hall, City Sports Club Cebu on October 07, 2011 from 9:30am to 5:30pm. Eminent speakers working in this field are going to gather for the this Cebu Event. Learn and be aware of the concept of energy consumption, conservation, management and its system that would benefit your Company and the world. Energy Management is the key to saving energy in your organization. Much of the importance of energy saving stems from the global need to save energy – this global need affects energy prices, emissions targets and legislation, all of which lead to several compelling reasons why we should save energy at your organization specifically. 0 comments: on "CCCI organized Sustainable Energy Management Awareness Seminar"